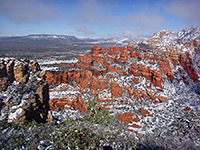 The forests, canyons and mountains around Sedona have more maintained trails than anywhere else in Arizona. The popularity of the region, and the ease of access to most of the paths means that true solitude may be hard to find, and the hiking is rather tame compared to, for example, the Grand Canyon or the Escalante River in Utah, but there is no doubt about the beauty of the red rock scenery. New trails are added regularly; most of the development in recent years has been in the lower elevation areas close to the town, where there are fewer major landmarks. The hiking list below is divided into three regions: Red Rock Secret Mountain Wilderness, Munds Mountain Wilderness, and the area immediately around Sedona and the Village of Oak Creek. 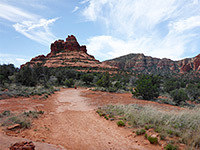 Use the Sedona map to locate the trailhead for each hike. #100 2.5 2,000 This short but very steep trail ascends the west side of Oak Creek Canyon, leading to a look-out tower at 7,200 feet, which may be accessed from the top of the plateau by a long drive on forest road 231. The trailhead is at the Bootlegger Campground on AZ 89A, at about mile 383.3. #54 2.4 1,800 The hike to the top of Bear Mountain is one of many reached along Dry Creek Road (FR 152) and later Boynton Pass Road, starting from AZ 89A 3.2 miles west of the AZ 179 junction. The narrow, steep, sometimes rocky trail climbs up the side of the mountain and has ever improving, panoramic views, especially to the south. Bear Sign 2.2 400 Bear Sign Canyon is one of the more remote places near Sedona, and there really is a good chance of spotting traces of black bear activity, or even the animals themselves. The trailhead is at the end of the unpaved portion of Dry Creek Road, and the increasingly narrow canyon can be followed for some distance beyond the end of the official trail. #47 3.0 500 The hike along red walled Boynton Canyon is very popular - it is easily reached by the paved Dry Creek Road, and has no difficult spots or steep climbs apart from a short uphill section at the very end. The main path is 3 miles long, but the canyon has several branches and all day could be spent exploring it. #119 3.8 600 This easy trail climbs up a shallow canyon to the flat-topped Brins Mesa, a spur of Wilson Mountain, then continues down the far side. All of the trail has expansive views in most directions. It has two trailheads - south access is at the end of Jordan Road, starting from Highway 89A just north of the AZ 179 junction, while the north access is 3 miles along the unpaved section of Dry Creek Road. #143 0.7 800 The Cookstove Trail is the shortest of four routes to the east rim of Oak Creek Canyon, near its northern end. It starts from Pine Flat Campground, ascending through mixed woodland to a viewpoint on a basalt outcrop. #120 1.9 300 The bridge is actually a large natural arch in the red Supai sandstone cliffs on the north side of Capitol Butte, and reached by a short hike from Dry Creek Road (FR 152). The best views are obtained from the top of the bridge, which overlooks a large area of canyons and mesas in the Red Rock Secret Mountain Wilderness. #60 0.7 400 Doe Mountain is an isolated, 450 foot high mesa with a perfectly flat top. The trailhead is the same as for the Bear Mountain Trail, and although the path ascends quickly to the summit in less than a mile, it is worth walking all around the edge (about another mile), to see views in all directions. #52 2.7 700 A gentle walk along a narrow, wooded, increasingly steep red rock canyon with sandstone ledges and cliffs, this starts right at the north end of the Dry Creek approach road, so receives fewer visitors than other trails closer to Sedona. #53 1.0 250 Fay is a short box canyon containing a natural arch, a seasonal stream, and a collection of desert plants typical of the lower elevations around Sedona. The trailhead is along Dry Creek Road then Boynton Pass Road. #51 0.7 700 This short path is the easiest of four routes to the east rim of upper Oak Creek Canyon, climbing steadily through conifer woodland to edge of a volcanic plateau. 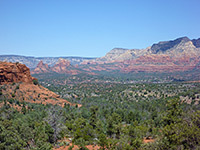 #50 1.6 300 HS is a typical Sedona canyon - moderately narrow, forested at lower levels but with sheer red cliffs higher up. The short trail to it extends about half way along, and begins 0.6 miles along the path to Secret Canyon. #122 3.7 1,000 Long is a forested canyon with many red cliffs and eroded formations, and, more unusually, some ancient Indian ruins and petroglyphs, though these are hidden and inaccessible. As with most canyons hereabouts, the trail is mostly level and quite easy, apart from at the far end. The start point is on Long Canyon Road, starting just south of the Seven Canyons golf resort. #5 4.8 2,000 Loy Canyon is 14 miles west of Sedona on FR 152 and then the unpaved Loy Butte Road, in a remote and little visited area. The lower reaches are very wide and level but the drainage narrows sharply at the upper end, where the trail ascends steeply to a forested ridge at 6,500 feet, on the other side of which is the upper part of Secret Canyon. #123 2.1 1,800 Starting at the Encinoso picnic area on AZ 89A, 2 miles north of Sedona, the North Wilson Trail climbs half way up Wilson Mountain where it links with another trail that leads to the summit, 2 miles further. Not many trails ascend the walls of Oak Creek Canyon, so this is a popular route, despite its strenuous nature. #121 4.4 800 Secret Canyon is narrower and more overgrown than most, and contains a year-round stream with pools and cascades. The trail starts along the unpaved part of Dry Creek Road, and although the official distance is 4.4 miles, a fainter path continues some distance further. #109 5 level overall This trail winds along the south edge of Secret Mountain, past the tops of several deep canyons including Hart Well, Boynton and Long, and ends at a small summit at 6,607 feet. The starting point is the ridge at the end of Loy Canyon Trail, so the total (one-way) distance is 10 miles, and this is a trip more suitable for backpacking. 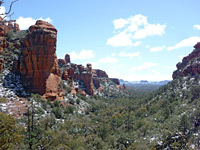 The views along the path are about the most spectacular anywhere in Sedona. #66 2 450 An easy route up to Brins Mesa via the wooded canyon of Soldier Creek, this path enters the wilderness area near the end, and links with the main Brins Mesa trail. #46 2.4 1,100 The Sterling Pass route leads steeply up the side of Oak Creek Canyon and over a ridge into the upper end of Sterling Canyon, then descends this ravine as far as an overlook of Vultee Arch. From here, the Vultee Arch Trail continues downstream, linking with FR 152. #72 1.2 1000 Named for a nearby telephone line, this short, steep path climbs to the east rim of Oak Creek Canyon, though a mix of thick woodland and more open areas. #142 1.0 900 Short but steep, this trail is one of five that climb the east side of Oak Creek Canyon, and all have excellent views from the top. The trailhead is along AZ 89A at about mile 384.5 but the usual parking place is at the Call of the Canyon day use area, 0.25 miles to the north. #22 1.6 400 An easy hike along Sterling Canyon to a viewpoint of a large natural arch, starting from the north end of Dry Creek Road (FR 152). #108 3.0+ 200+ The best canyon hike in the Sedona area - the west fork of Oak Creek is a beautiful red rock gorge that has a sizeable stream flowing through, and many eroded rock formations and narrow sections. #49 1.2 300 A short, easy trail along a box canyon just north of Sedona. Starting point is beside Midgely Bridge, 2 miles north of the AZ 89A/AZ 179 junction. Most of the hike is through shady, wooded land, but the last section rises above the trees to a fine viewpoint. #10 4.5 2,450 This is the most strenuous trail in the Sedona area, and with the highest elevation gain, but of course the views at the top of the mountain are excellent. The first 2 miles of the trail is steepest - the remainder is mostly level, as it follows the flat top of Wilson Mountain northwards, ending at a promontory overlooking Sterling Canyon. Starting point is near Midgely Bridge, 2 miles north of the AZ 89A/AZ 179 junction. #94 8 2,300 Hot Loop (a one-way path) starts at the Red Rock Ranger Station alongside Dry Beaver Creek, which crosses under AZ 179 two miles south of the Village of Oak Creek. 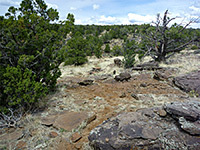 The trail soon climbs steeply to a plateau, followed by a long, mostly level walk along Horse Mesa, high above Woods Canyon, and ending with another climb to the main plateau at Jacks Point Tank. Connecting paths at the start and finish (the main one is Jacks Canyon Trail) allow for a long loop hike. 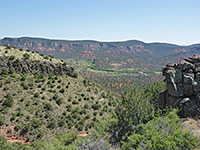 #55 6.6 2,000 A long hike beside the bushy streamway in Jacks Canyon, between Munds Mountain and Horse Mesa, ending with a steep ascent up the side of the Schnebly Hill plateau, which offers panoramic views over the surrounding landscape. 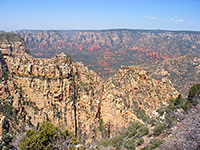 Start point for the hike is 3 miles along Jacks Canyon Road, which forks off AZ 179 in the middle of Oak Creek village. #163 2.2 200 This is a lesser-used path through woodland on the western foothills of Munds Mountain, quite close to the center of Sedona, linking Morgan Road with Schnebly Hill Road. #77 2.5 500 Beginning at the north end of the Jacks Canyon Trail, this path climbs further to the summit of Munds Mountain at 6,834 feet, then follows the ridge a little way to the south. The scenery hereabouts is a little less spectacular than places to the north; the landscape is more vegetated, and the rocks are mostly white rather than red. #158 1.7 400 An old roadbed provides a course for this initially steep trail, heading south from Schnebly Hill Road near the upper end of its climb from Oak Creek valley. The path reaches the edge of a grassy plateau and follows this south to intersections with the Munds Mountain and Hot Loop trails. #93 4.9 450 An easy walk beside Dry Beaver Creek through the initially wide valley of Woods Canyon, beneath red rock cliffs and formations. The canyon can be followed further upstream for many miles beyond the end of the official trail. Start point is the same as for the Hot Loop Trail. #211 4.3 150 Including the short Table Top Trail (#212), this mostly shadeless loop path is just over 4 miles in length, circling the flat summit of Table Top Mountain, site of Sedona Airport. #111 0.5 level This is one of the few trails right beside Oak Creek, a short path that links the Grasshopper Point picnic area (2 miles north of Sedona on AZ 89A) with the trailhead for Casner Canyon, passing nice red rocks of the Supai formation on one side and the fast flowing waters of the creek close by on the other. Bell Rock Pathway 3.7 180 The popular Bell Rock Pathway follows close to Hwy 179 (east side) for 3.5 miles, starting in the north at the Little Horse trailhead, passing beneath Bell Rock and ending at Courthouse Vista, at the north edge of Vilage of Oak Creek. #125 1.5 300 Broken Arrow trail offers a quick route into red rock landscape, starting at the end of Morgan Road, which meets AZ 179 one mile south of the AZ 89A junction. 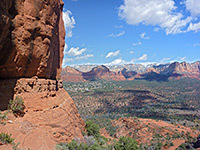 The path is easy and well used, and climbs gradually to a slickrock pass between two high buttes (Chicken Point). The Little Horse trail continues from here, providing an alternative route back to the highway. 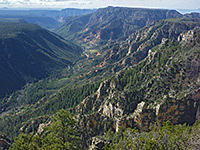 #11 2.6 1,500 There are six trails on the east side of Oak Creek Canyon, where the cliffs are more sheer than on the west side - the southernmost is along Casner Canyon, at first following close to the streambed then climbing steadily up the side of the ravine, right to the forested plateau. A short walk through the woodland reaches the Schnebly Hill Road. There is limited parking at the trailhead, or more space at Grasshopper Point picnic area, which is linked to Casner Canyon by the Allens Bend trail. #170 0.7 600 This short hike leads to the base of one of Sedona's most famous red rock buttes, starting from the Back of Beyond Road on the west side of AZ 179, 3.4 miles south of the AZ 89A junction. #135 3.4 (loop) 200 A loop around the famous Sedona landmarks of Bell Rock and Courthouse Butte, alongside Hwy 179. The rock is very busy but not so many people walk all around the butte, along a sometimes rocky path that gives ever-changing views of the red rock surroundings. 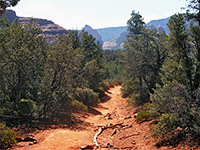 #162 4.5 360 This path follows part of the lower canyon of Dry Creek, west of Sedona, in places quite narrow and shady. The southernmost section climbs above the drainage and traverses an open plateau. The route is accessed from the north along Dry Creek Road, from the south just off US89A. #124 3 150 The Jim Thompson Trail is a connecting route between the Midgely Bridge (Wilson Canyon) and Jordan Road trailheads, crossing undulating, lightly wooded land of ridges and drainages. #61 1.5 300 A gentle route leading through open land towards high red buttes, this trail begins beside AZ 179, 3.6 miles south of the AZ 89A junction, and ends at Chicken Point, where the Broken Arrow trail continues northwards. #2356 0.8 360 At 4,899 feet, Schuerman Mountain is one of Sedona's lesser summits but the short trail to the top still gives nice views over the town, and Oak Creek valley in Red Rock State Park to the south. The main trailhead is along the upper (east) section of Red Rock Loop Road, and this meets AZ 89A 4 miles west of the junction with AZ 179. A longer trail continues past the summit and joins the southwest part of the loop.